LiveCode LessonsGetting Started with LiveCodeGet Up and Running with LiveCode Server PrerequisitesHow do I install LiveCode Server? 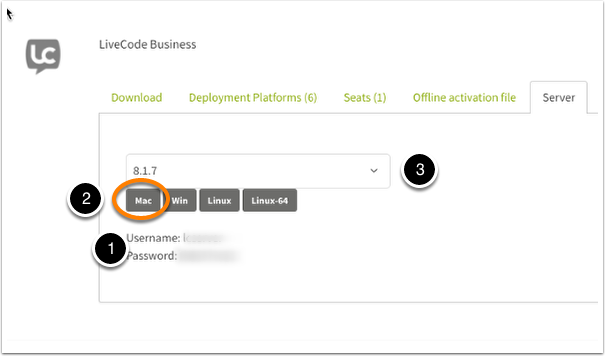 This lesson will walk you through the steps required to install LiveCode Server on your platform. LiveCode Server is included with any Indy or Business purchase of LiveCode. To download it check your LiveCode account, you will find a tab labeled "Server". In this tab you will find your username and password (1) to download Server, as well as download buttons (2). You can select your Server version in the drop down menu (3). To begin downloading, click on the download button for your platform and enter the login credentials when prompted. Once downloaded, you can unzip and explore the contents. Your LiveCode server package should look similar to the image above, containing the server engine itself, the externals, the database drivers and the release notes. You are now ready to begin running LiveCode Server. The LiveCode Server engine can be run in two modes: Command line mode and CGI mode. To run the engine in command line mode, open up a command prompt and execute the "livecode-server" ("livecode-server.exe" on Windows) binary, passing the script name you wish to run as the first argument. The image above demonstrates how to execute the script along with the expected output. The second mode the LiveCode Server engine can be run in is CGI mode. Running LiveCode server in CGI mode allows you access your LiveCode script files using HTTP i.e. as web pages. For example, if you have a script named myscript.lc, when run in CGI mode, you will be able to access it by typing the URL of the script into your web browser (e.g. http://www.my_site.com/myscript.lc). In order to do this, your machine must have a web server package installed and .lc file extensions mapped to the LiveCode Server engine. If you don't have access to your system's Apache configuration, see the lesson "How do I install LiveCode Server with Apache via .htaccess?". Thanks Martin, I have updated those links.